Oh yeah, Trump is real sound money guy. How absurd. 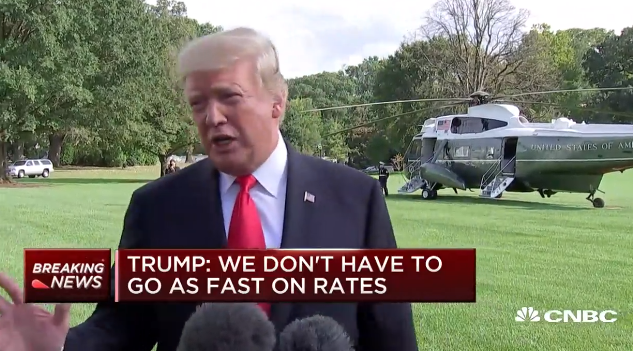 President Trump said this afternoon that he does not like the Federal Reserve's decision to continue to hike interest rates. Trump added that he has not spoken to Federal Reserve Chair Jerome Powell about the central bank's moves to raise rates. Trump is just not in touch with reality when it comes to price inflation--or is lying to the public. As can be seen in the chart below, the CPI bottomed for the current cycle in January 2015 and has been generally climbing ever since. It is now at the 3.0% level, a full percentage point above the Fed's "target" price inflation rate of 2.0%. I am warning in the EPJ Daily Alert that price inflation could explode upside (first stop 5%) at any time. If anything the Fed is far behind in fighting price inflation.